A Royal Navy ship undertakes a perilous voyage in pursuit of the Northwest Passage, but treacherous conditions, limited resources, and low morale plague the crew. 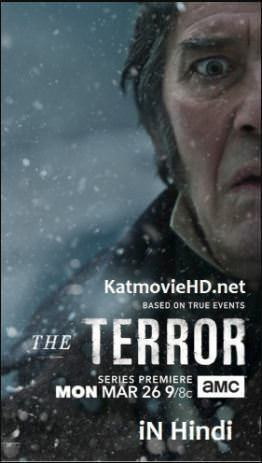 The Terror is an American television series that premiered on AMC on March 25, 2018. The series is based on the 2007 best-selling novel of the same name by Dan Simmons The crews aboard the Royal Navy‘s polar explorer ships HMS Erebus and HMS Terror venture into uncharted territory seeking the Northwest Passage. The ships are soon stuck, frozen and isolated; and those aboard must survive the harsh weather conditions and each other. Set in 1847. A crew of a Royal Naval expedition is sent to find the Arctic’s treacherous Northwest Passage but instead discovers a monstrous predator, a cunning and vicious Gothic horror that stalks the ships in a desperate game of survival, the consequences of which could endanger the region and its native people forever Inspired by a true story, The Terror centers on the Royal Navy’s perilous voyage into unchartered territory as the crew attempts to discover the Northwest Passage. Faced with treacherous conditions, limited resources, dwindling hope and fear of the unknown, the crew is pushed to the brink of extinction. Frozen, isolated and stuck at the end of the earth, The Terror highlights all that can go wrong when a group of men, desperate to survive, struggle not only with the elements, but with each other.